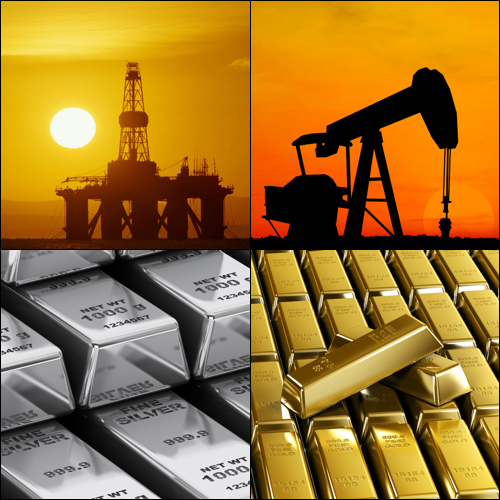 Where Can I Access Live Commodities Prices? Where Can I Get Live Commodities Charts? Where Can I Get Live Commodities Prices? FinancialSpreads provides investors with real time pricing on more than a thousand financial spread betting markets including the commodity markets listed above and a large variety of shares, currency markets and stock market indices. Financial spread betting, including commodities spread betting, is currently tax-free in the UK. Note though, tax treatment does depend upon the individual circumstances of each client and can change in the future. 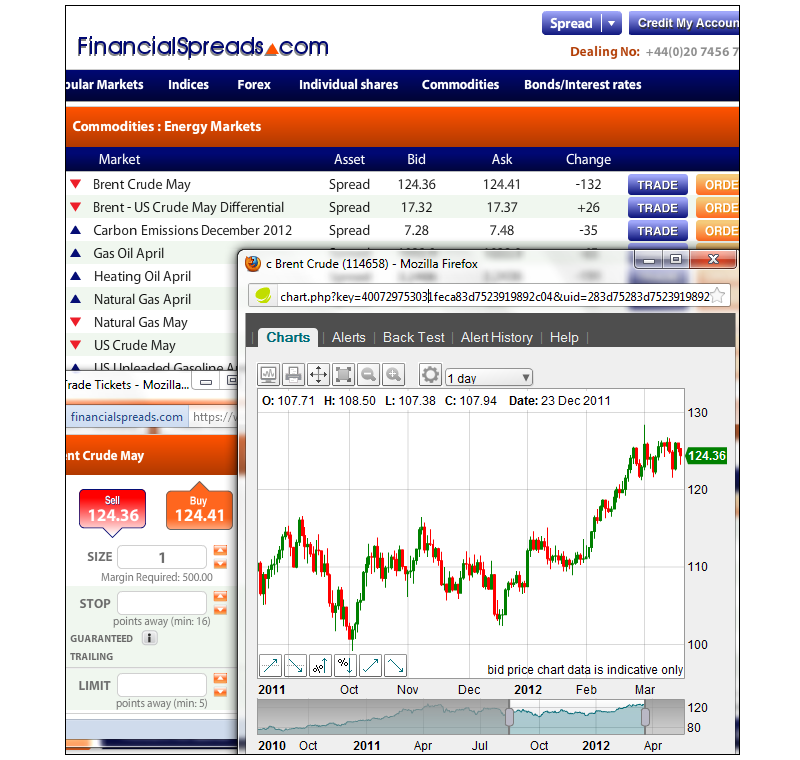 FinancialSpreads lets traders practice their commodity trading via a Demo Account. The Demo Account comes with a variety of commodities like gold, silver, both Brent crude oil and US crude oil as well as a large number of indices and forex markets. Our Demo Account doesn't just cover financial spread betting, you can also practice your CFD trading. Investors can access real time trading charts for commodities and more than 1,000 other CFD and financial spread betting markets. Technical indicators such as MACD, Bollinger Bands, TSI etc. A variety of intervals such as 1 minute, 4 hours, 1 day etc. In the example below we look at the popular Brent Crude Rolling Spot market. This market is a 'Rolling' market and so there is no closing date for this trade. If you don't close your position and the session ends then your trade will roll over into the next trading day. Note that if a trade is rolled over then you will either pay or receive a small fee for overnight financing depending upon whether you are betting on the market to go up or down. For more details see Rolling Spread Bets. Points (Units) Traded: Bets on the Brent Crude market are made in £x per cent. Where a cent is 1¢ of the energy's price movement. E.g. if Brent crude changes by 35.0¢ then you would lose or gain 35 times your stake. Stake Size per Unit: You work out how much you are going to stake per cent, e.g. £3 per cent, £5 per cent, £10 per cent etc. Quick Staking Example: If, as an example, your stake is £4 per cent and Brent crude moves by 27.0¢, you would win/lose £4 per cent x 27.0¢ = £108. Take a Profit? You may opt to let your spread bet run or close it, i.e. close your trade to lock in your profit. In this case you choose to settle your position by selling the market at 6183.4¢. Limit Your Loss? You may decide to let your trade run or close it, i.e. close your position and limit your losses. In this case you decide to settle your trade and sell at 6108.2¢. Lock in a Profit? At this point, you could opt to leave your spread bet open or close it and take your profit. In this instance you opt to settle your position and buy the market at 6103.6¢. Limit the Loss? At this point, you can opt to keep your position open or close it in order to restrict your loss. In this case you choose to close your position by buying at 6171.3¢. Product Description: A Commodity Spread Bet is a leveraged financial derivative based on the price of a commodity such as oil or gold. Spread Bets are leveraged financial products, meaning that you only have to invest a small percentage of the notional value of a transaction. 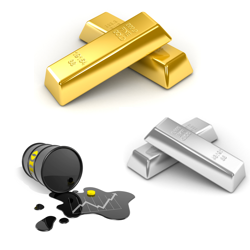 We offer a two-way price on a number of Commodity Spread Bets. For instance, we may quote the Spot Gold Spread Bet at 1265.0-1265.4. If you expected Gold to rise you would buy at 1265.4, if you expected it to fall you would sell at 1265.0. You would nominate the stake per tradeable unit, in this case it would be the amount you wished to stake for 0.1 point movement in price. Let's say you chose to buy a stake of £10 per unit at 1265.4. This would equate to a notional value of £12654 (1265.4 multiplied by £10). In order to place the trade we would require margin on your account of 1% of the notional value of the trade, which equates to £126.54 in this case. In the above example, the value of your open position would increase by £10 for every 0.1 point increase in the price of Gold and decrease by £10 for every 0.1 point fall in the price of Gold. There are two types of Commodity Spread Bets, Cash based and Future based. For Cash based Commodity Spread Bets there is a cost of holding a position open overnight, known as the Overnight Financing Charge.